The Ombudsman of Catalonia, Rafael Ribó, presented the Annual Report 2017, to the President of Catalan Parliament, Roger Torrent, on 9 February 2018. 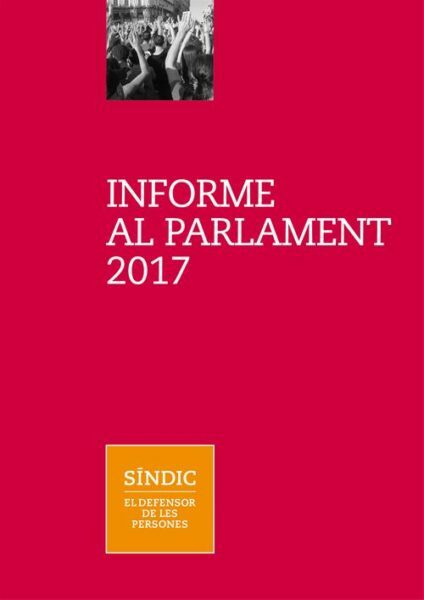 The report and a summary of all decision issued are available on the website www.sindic.cat. In 2017 10,166 complaints have been filed, more than 16,000 have been processed and 281 ex-officio actions have been opened. Since many complaints have a collective nature, 60,000 people have been concerned by these actions, which is twice more than the previous year. In the last two months of 2017, the Catalan Administration has undergone internal changes and cessation of people in positions of responsibility under article 155 of the Spanish Constitution. This has slowed down the acceptance or non-acceptance of the Catalan Ombudsman’s decisions. Even so, 98% of the resolutions were accepted completely or partially. In fact, only 1.6% have been rejected by the Administration, while in another 22.2% have been only partially accepted. The work done by the Ombudsman’s itinerary office is also worth noting since it has visited 115 different municipalities. This year more than 7,000 complaints and queries related to municipalities have been processed, 45% of the total amount. The Ombudsman notes that the area of social rights is one of the most affected by the Spanish Government appeals before the Constitutional Court against many of the laws passed by the Catalan Parliament. Since 2006, the Spanish executive has filed more than forty appeals, of which more than half have affected the Catalan social policies and the collection of taxes of the Catalan Government. This year, the actions taken in the area of social rights have again stood for nearly a third of the total of the complaints received by the Ombudsman, through it must be mentioned that for the first time in many years, complaints in this area did not reach 30% of the total. In particular, the Royal Decree 897/2017 of 6 October 2017, regulates the figure of the vulnerable consumer, tariff subsidies and other protection measures for domestic consumers of electricity. Despite the social advancement that this legislation may mean for the most vulnerable, the Catalan Ombudsman must express his concern regarding this report and the possible work overload it may bring about for social service centres, in terms of increasing the number of formalities to be completed by professionals, as well as the higher number of persons accessing the social services network. The insufficient allocation of resources may worsen the situation. For more information, visit the Catalan Ombudsman’s website www.sindic.cat.